Ebony and I are creatures of habit. We like the routines and rhythms of a day at home without appointments. (Amore craves more variety, except first thing in the morning.) The first expectation of every day--well, after Amore hits snooze on the alarm clock at least once--is that he opens the door of Ebony's crate. Ebony shoots off like a rocket down the hall, Kong in his mouth, because the Kong usually still contains the bedtime cookie from the night before. 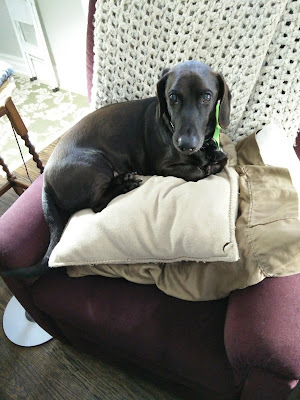 By the time we slow and decrepit humans get to the coffee pot, Ebony is sitting on the love seat drooling, tail thumping like the drum in a military band. When we sandwich him there, hot beverages in our hands, he either drops the Kong in our laps or throws it at us, (depending on the value he has assigned to the kind of cookie inside). This is his way of asking us for help in extracting said cookie, which sometimes is easier said than done, especially before our first cup of coffee. Some days since my shoulder surgery have been different. While the bones heal on the right side, I must sleep on my left side. Many nights my body protests this at some point and I move to the reclining love seat in the living room, currently my only alternative for pain-free sleep. On those mornings, Allen hits snooze back in the bedroom. When his feet hit the floor, he opens Ebony's crate. Ebony flies down the hall, with or without the Kong, and takes a flying leap from halfway across the living room into my lap. On these days I awake to a jolt followed by a flurry of kisses, tail wags, and possibly a Kong thrown at my face. This Monday morning I had relocated to the recliner at 2:30 am and settled back into a sound sleep. I didn't hear the coffee or tea maker through my ear plugs but awakened to a sense of movement and the light coming on in the adjacent kitchen. Amore trudged past the table and made his way to the coffee. What? No flying Labradoxie tackle? No Kong in my lap? I asked Amore where Ebony was. Had he forgotten to open his crate? No, it was open. Ebony, he said, thought I was still asleep in the bedroom and had settled in there to wait for me. Didn't he tell him I wasn't there? Yes, but he didn't believe him. I'd have to go show him myself. Drawing on the ninja skills apparently acquired during the night, I tiptoed walked as quietly as I could down the hall and peered into the room. 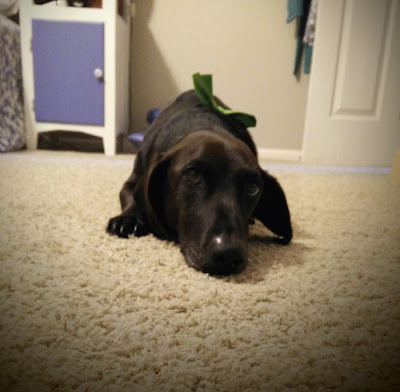 Ebony had stretched out in the prettiest "down" you could want to see, his face towards my side of the bed with his Labrador ears aimed like satellite dishes at the pile of pillows he thought was me. His Kong lay on the floor beside him, cast aside in his preoccupation with the bed. Clearly, he was not going anywhere without his mama, and he'd wait as long as it took. "Ebony," I said, "I'm back here, sweetie." He bounced up and pivoted to face me, all in one springloaded motion. His tail started wagging and he bounded toward me, stopped, turned back for his Kong, and raced past me down the hall to resume our usual routine. In the moment, I laughed at his misunderstanding and smiled broadly at how loved and cherished it made me feel. Where "Special Agent Hoover" is concerned, there will be no man left behind, especially not me. As I've pondered the memory in my heart for a day or two, though, I've asked the Lord if He had something more He wanted me to learn from this. If Ebony in this experience were analogous to me, and I were analogous to my heavenly Master (which, granted, demands tremendous suspension of disbelief), similar to the sheep-shepherd metaphor of the Scriptures, what might this teach me? First, Ebony's dedicated expectation challenges me to keep hoping, keep waiting on God when I'm growing faint in my prayers and answers seem long in coming. In that morning, his routine didn't matter; his Kong didn't matter; a cozy nest on the love seat didn't matter. All that mattered was waiting on his master. Do I do that, or am I quick to give up and look for solutions and satisfaction elsewhere? Too often, the latter. waiting for our blessed hope, the appearing of the glory of our great God and Savior Jesus Christ (Titus 2:13). The "what," then, is the glorious appearing of our God and Savior Jesus Christ, the consummation of all the promises of God. We are waiting for God Himself. For the grace of God has appeared, bringing salvation for all people, training us to renounce ungodliness and worldly passions, and to live self-controlled, upright, and godly lives in the present age, waiting for our blessed hope, the appearing of the glory of our great God and Savior Jesus Christ, who gave himself for us to redeem us from all lawlessness and to purify for himself a people for his own possession who are zealous for good works (Titus 2:11-14). When I yield to the grace of God's training, I learn "to renounce ungodliness and worldly passions." Grace teaches me, us, "to live self-controlled, upright, and godly lives in this present age." The comely, appropriate, obedient way to wait for our Blessed Hope is to live increasingly in accordance with Christ's self-giving "to redeem us from all lawlessness and purify for Himself a people for His own possession who are zealous for good works." The grace that meets us as we are does not leave us as we are. Insofar as my life doesn't look like that, I am waiting for Christ's return in the wrong place, in the wrong way. He will enable even my waiting as I turn my face toward Him. He waits to be gracious to us. He exalts Himself to show mercy to us. Blessed are all who wait for Him. Last week rather pulled the rug out from under us, dear Crumbles. Tuesday morning Ebony experienced a sudden, traumatic health crisis. While he was at the veterinarian for observation and additional testing, I laid my dog, my only dog, whom I loved, on the altar and yielded him to the Father's plan. Wednesday afternoon we learned he had cancer of the spleen with cardiac complications. The heart arrhythmia ruled out surgery, but the prognosis was very poor even if it had not. Although it was one of the hardest things I've ever done, we followed the doctor's advice and said good-bye to him Friday after a couple of days to cherish him and let the other nearby family members see him one more time. He was around 12 years old and had seemed in good health, other than occasional bouts of back pain. Next month would have marked a decade in our family for him. Even as I grieve the loss of my shadow, I thank God for gracing us with Ebony's life. Ten years feels too short, but I know it's better than I or anyone deserves. That pup loved us with every fiber of his being and brought sunshine everywhere he went. If you have read here long, you know a good deal about the Ebony Dog already, but here are some tidbits you may not. 12. His experience in our family wasn't always lollipops and roses. He came to us very shy (and that's coming from a shy person), anxious, and afraid of men, Amore included. (This did not become apparent until we got him home.) We undertook a crash course in dealing with anxious dogs, enrolled in obedience school, and worked with him over the course of years to help him be the best and bravest dog he could be. Also, Steinway, our geriatric alpha dog, was pretty chagrined that he didn't have any say in the matter of another dog joining the household. 11. Most of the "tricks" (in nephew-speak) he learned were part of the obedience training recommended to help his anxiety. Spin around and roll over were my additions for fun. We all developed a gesture over time for "Where is_______ (your ball, Squirrel Dude, the Kong, etc.)?" "Clean up!" became his cue that we'd dropped a food item on the floor which he was allowed to eat. "Uh-oh!" accidentally became another version of that command, because he wasn't stupid. The final command he had mostly mastered was "Bring it." The last Today puppy gave me that idea as a way to prevent me from having to reach into the far corners of his crate or under furniture to get a lost Kong out. We will definitely keep that on the list for our next dog. 10. 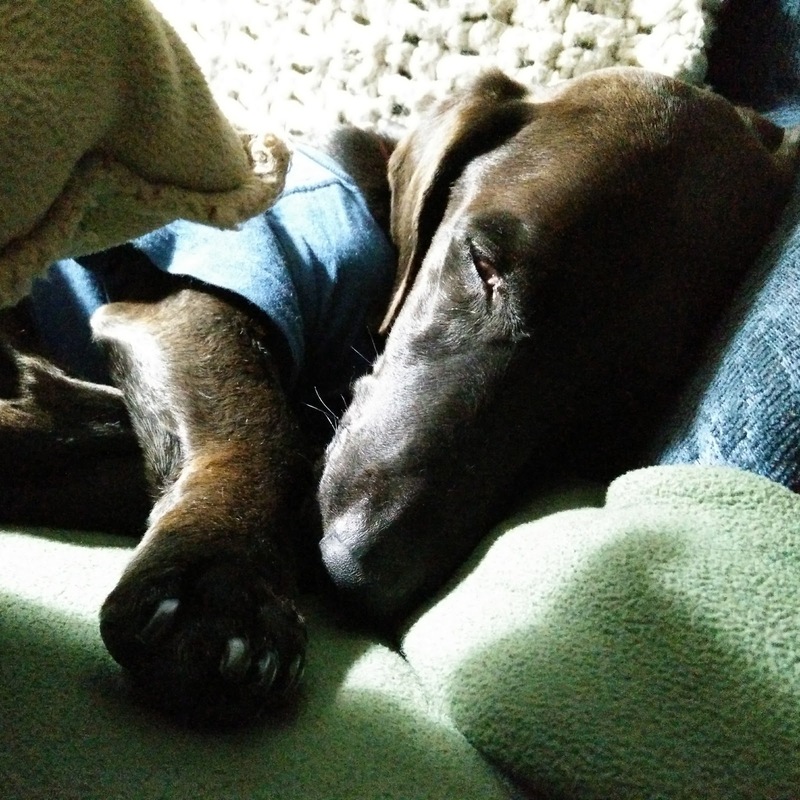 He slept in a toddler's t-shirt or sweatshirt every night. Originally that was part of our calming strategy for him, like a Thundershirt, but we continued because he loved his "pajamas" and looked so adorable in them. Sometimes he turned on his Super Gravity Dog powers if he didn't want us to take them off in the morning. 9. He had an enormous bark, which he almost exclusively used when I was with him. His mild-mannered persona usually seen here was his Clark Kent cover identity. In reality he appointed himself my protective detail and gallantly protected me from every slam of a car door and every leaf skittering across the porch. This was most pronounced if it were dark and Amore were absent. The barking stopped once the real man of the house came home and took over protecting me. Amore says our shy Ebony Dog would have taken on a lion if he believed I were in trouble. 8. There's no sense preserving his cover now, so I may as well tell you that he was a secret agent with the Canine Investigative Alliance (CIA), trying to take down the nefarious Dr. Miao (cue evil laugh) and her henchcats. He said the squirrels were her confidential informants, and apparently the bunnies in our new neighborhood were double agents working for her. 7. His code name was Special Agent Hoover. Like the vacuum. His motto? "No noms left behind." 5. His favorite game was hide-the-bone (and more recently, hide-the-Mommy). We would put him in a "stay" in one room and then hide his favorite rawhide bone somewhere else in the house. Then we would go back to him and tell him to "take it." He would take a flying leap across the room and gallop down the hall until he picked up a trail. He got so good at this that we had to leave false scent trails and not go straight to the hiding place. 4. 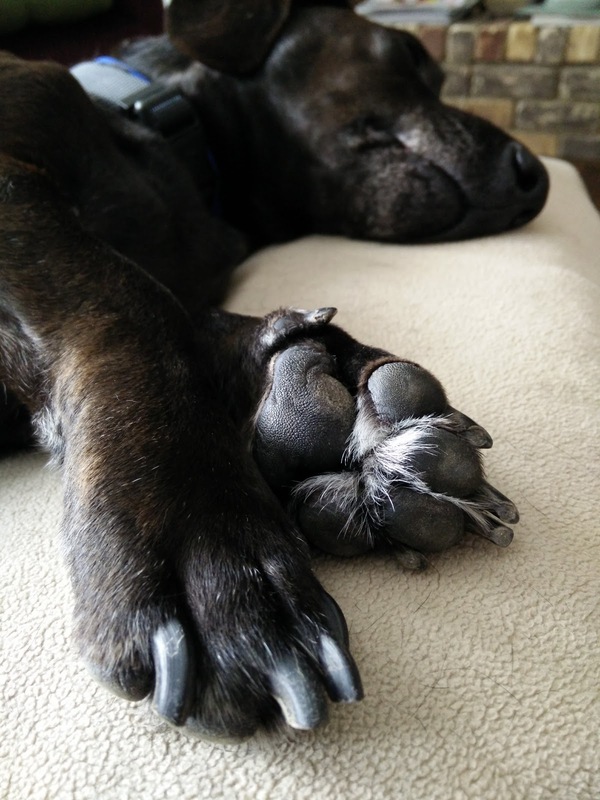 When he slept, his paws smelled like Fritos. 3. He loved pillows and blankets, the more, the better. The exception was if the blankets were protecting a piece of furniture or the pillows were blocking his access to the chair he wanted for his nap. 2. Even though he was shy, he loved the people he accepted into his pack devotedly and without reservation. He surprised everyone by adding the three youngest nephews to that number in the last couple of years. He consented to obey their commands as long as they paid him in treats. 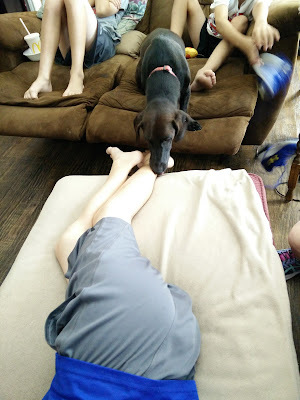 He never growled or snapped at them, even when they held onto his tail and put their faces close to his, nose to nose (which is generally not advisable with dogs). He knew the words "Grandma and Grandpa," and his favorite place to go in the car was to their house. He could not settle down to rest in the evenings or go to bed at night until he'd had his special fuzz therapy time with Amore, and they were daily walking buddies for most of Ebony's life with us. Ebony loved and respected Amore as the alpha dog in our little pack. 1. I was his favorite of all. We both spent more of our waking ours with each other than with any other living thing. He helped me through a long season of being completely or mostly homebound and through several surgeries and many other procedures. He was such a Velcro dog that he didn't even like having a closed door between us, and his tail was a consistently reliable "Mommy Proximity Alert" system. We were both braver together than apart, and it turns out that separation anxiety works both ways. For the last week I've felt like Linus without his blanket. I don't know whether I will ever see him again in the new heavens and earth. The Scriptures neither promise nor exclude that possibility. C. S. Lewis and John Wesley thought it possible that animals, or at least the companion animals of believers, will be restored in the Resurrection along with the rest of this groaning Creation. I'm grateful to have had him as long as I did, and, really, no amount of time would have been long enough. The letting go would always have required a sacrifice of praise and thanksgiving.